Published: Dec. 24, 2016 at 03:11 p.m.
Buffalo Bills QB Tyrod Taylor finds wide receiver Sammy Watkins for a 53-yard catch. Published: Nov. 12, 2015 at 11:38 p.m. Published: Nov. 12, 2015 at 09:34 p.m. 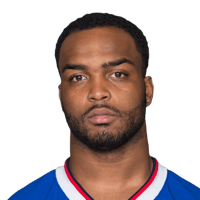 Published: Oct. 25, 2015 at 11:35 a.m.
Bills defense stops the Jaguars on 4th and goal.